No one wants to make a decorating mistake, but decorating is a pretty tough project and mistakes can happen, so start your projects with a little help from your friends, Matt and Shari, then check out the latest decorating faux pas! What I’d like to do is point out 20 of the most common mistakes so you can have them in mind while you are decorating. Some of them might be obvious to you but to others they are a new idea. I think what happens is we get so used to having some things around that we keep repeating them even though styles have changed and decorating trends have moved on. Many of the things I’ll mention are just ideas that have had their time and there are new options for your home that you should try just in the name of – progress. 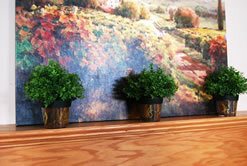 So let’s get started with Matt’s pet peeve and decorating mistake number 1; Faux Greenery. Some is good, too much is bad, and the style of faux greenery you are using makes a difference as well. 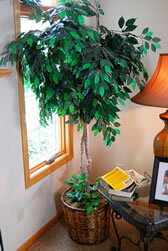 The style of faux greenery has changed in the past few years, and large ficus and palm trees like this one need to go. Especially when they are covering up windows that look out to live evergreens! Move plants like this to lesser rooms in your home like the basement rec room or a screened in porch – that way a decorating mistake isn’t a costly mistake. However, faux greenery like these small leafed shrubs are fine because they are smaller scale and contained, not vining all over the place like many of the baskets of ivy and other vines we used to stash on top of armoires and kitchen cabinets. Remember, there is a place for greenery, but it has to be done right. Visual Clutter. Unfortunately, this is another one of Matt’s pet peeves! But if there is one thing that really puts a damper on a beautiful room, it’s clutter. It’s the stuff that should just be put away, like magazines, books, projects and shoes. If you want these items in the room, create a storage piece for them. Visual clutter can also be just having too many accessories that bog a room down. 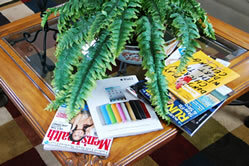 For instance, sometimes there is just too much going on at a coffee table. Generally, if you can’t see the table…you have too many things on it. The same goes for collections of things. I understand the idea of a grouping of ceramic vases, but if they don’t really co-ordinate very well and they don’t do anything for the room – except make it look cluttered- take them away, or at least some of them! When you remove some of these things you are going feel a big weight off your chest – I promise. It feels so good to have space to breathe and it’s calming to have less stuff to take in visually. And decorating mistake number 3 fits right in with the clutter. It’s Too Many Pillows!!! I know, I said it! But just look at this sectional, there’s hardly any place to sit down! A few are nice to add color and pattern and to be functional. I know my Mom always needs one behind her back because she is short, but she only needs one, not fourteen! A good rule of thumb here is to remove the pillows that MATCH the sofa or sectional because they do nothing for the look. 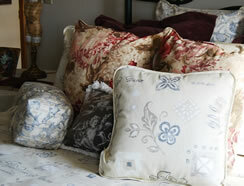 Add decorative pillows that express and support your design style. 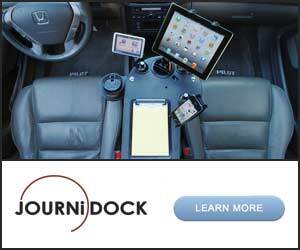 …deals with the Size of your Area Rugs. I don’t mind an area rug over carpeting at all, but when it extends way past the furniture and into the middle of the traffic pattern, then I start having problems. Area rugs that aren’t positioned correctly can be dangerous and cause trips and falls. The rug should either be within the limits of the sectional or seating arrangement or large enough to go past the traffic pattern. We suggest you make these changes right away! OK, take a look at the combination of art used in this room. It’s interesting. …and a couple of reclining women. Let’s take a moment to bring them all together and look at them. I do think it’s important for your artwork to make sense together. Too many mismatched pieces start looking like an art show. Usually in your home, you have a certain taste for art pieces and you purchase according to your taste. Even if you have a very eclectic taste in art, you still need to group pieces that make sense together. I don’t like these together because they don’t make any sense at all. The subject matter isn’t the same, the colors aren’t the same and the styles don’t match either. So decorating mistake number 5 is using …hmmm I hate to say “Mismatched” Pieces of Art because I don’t want people to start matching everything. I guess it’s more the style of the art. Try to select styles that go well together, where here we have three distinctly different things going on. Now, here’s an example of art that does go together. …and combine it with a miniature landscape that is very similar, but surrounded by a dramatic colorful painted matte. They are very different art pieces, but work very well together. You could combine an abstract of leaves if they were in similar colors or a vase of flowers in oranges and golds. They would complement each other and support the color story for the room. Themed Upholstery Pieces. I know in the past, Matt and I have decorated using a chair with a book patterned fabric on it for in a library, and we have done a golf themed chair like this one, but this home isn’t on a golf course, there is no one in the house that plays golf, and without really supporting this as a theme, (You might be able to see the fish pillows?) I think a chair like this just gets you into trouble because it isn’t very versatile. May I suggest that if you are into golfing or books or fishing, and you find a fabric with that theme on it that you walk right past. Support your themes with inexpensive pillows, borders, artwork and accessories instead of using items that are difficult to change, like upholstered pieces. Then, if one day you are tired of the fishing or golfing look, you simple change the accessories and you’re done. …comes directly from Matt. I’m not saying I disagree, I actually can find ways to take his idea and apply it to other areas of the house and have it make sense; here it is. “Nothing dates a room more than an old TV.” Is this just a guy thing meant to get us thinking about it and eventually giving in to updated electronics? Well, I suggested that if the TV is working fine, why would you get rid of it? His reply? “Then it can go up to the office or in the garage by our shop.” But if you are talking about the main area for TV viewing – you need to be up to date. Hanging on to Old Appliances is decorating mistake number 7. I justified his call as soon as he used the word “appliances” because I thought if we were in the kitchen and the refrigerator was 15 years old, it would do the same to the kitchen, just sort of bring it down a notch. Matt was thrilled with this, saying, “And that old refrigerator could be a blessing in the garage near the shop… Of course, I was starting to get it. All the old stuff brings the man cave up a couple of notches…maybe I’ll donate the golfing chair and old ficus tree too! Well, decorating mistakes happen all around the house, and the master bedroom is a place I usually find a lot. I think it’s because when we are decorating our homes, we think about the public areas first, you know, the kitchen, living room, family room, and dining room too. Then we move upstairs. 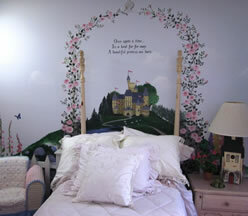 I was always one to make sure my kid’s rooms were in shape before even thinking about the master bedroom. So, it’s time to put yourself first and see if you have any of these decorating mistakes in your master bedroom! I’d like to start with an Overall Fear of Color as number 8. Yes, neutrals are fine and are certainly colors, but to do nothing with the walls….just look at all the pretty neutrals that would really dress this room up. I would probably select a gray or a darker taupe since this room is large enough to handle a darker color. Remember, it’s only paint. It will take a couple hours to get enough paint on the wall for you to experience it and if you really don’t like it – paint it back, or better yet, try a different color. Don’t be afraid, it’s your home and you should experience the joy of color!! And right away, I see that I don’t like the combination of patterns on the pillows and how they go with the bedding. The two floral pillows don’t make any sense at all. I guess the plum shams are an accent color for the room, though it isn’t picked up anywhere else, and although the cherub pillow is in a neutral, the bedspread is a contemporary pattern, so the two don’t mix very well. So Incorrect Mixing of Patterns would probably have to be decorating mistake number 9. Just eliminating the culprits will make this bed look right. Learn the right way to mix patterns in our Real Decorating for Real People Book. Staying with the bed in the master bedroom, I’m going to make number 10 be about the Dust Ruffle Length. 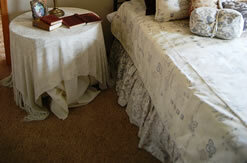 The dust ruffle on your bed should be about ½” above the flooring. This allows it to lie properly, yet you can’t see underneath the bed. So, if you are hiding things under there – your secret is still safe. When a dust ruffle rests on the floor like this one, it looks messy and never hangs right. All you have to do is either bring up the hem, or in the past, I have pulled the entire dust ruffle off the bed and pulled up the excess in the center. I pinned and sewed it all the way down the center and through the ruffle at the end of the bed. This will raise the dust ruffle up off the floor and you won’t even notice the seam at the end of the bed because the folds in the ruffle will hide it. So if you have decorating mistake number 10, I expect to see that sewing machine out fixing it right away! Now let’s take a look at the night stand and its contents. Can you tell that the lamp on the night stand is way too small for the bulkiness of the night stand and of course for the queen sized bed? This is nothing more than a night light in this room. It might be fine on a chest or maybe on a small dressing table. And, because it is a figure of a body, I’d almost thing it should be in the closet or near a ladies make-up area…something feminine, not out here as the main lamp in the room. 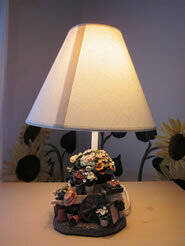 So decorating mistake number 11 is to make sure you have the Right Scale Lamp for your tables – night stands included. …HAS to be the night stand itself! I know we’ve told you for years that this in an inexpensive way to create a night stand until you save the money to buy a nice one with drawers and some storage. But the point is you should eventually get rid of it! This is one of those particle board tops on a set of lightweight legs. If I brushed past this table and touched it with my leg, it would actually wobble. Hahaha, maybe that’s why the lamp is so small! But to top it off, the table cloth is too big as you can readily see as it bunches up horribly on the floor, and the throw that was added is trying to cover that up, but not quite doing it. 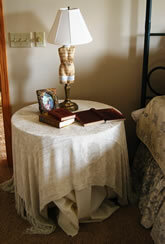 So, if you are going to have an inexpensive night stand, go the extra mile and hem up the table cloth! Make it unique by selecting a dark gray or use the accent color, like the plum to cover the table and give it some outward pizzazz. So number 12 is an Unsightly Night Stand, because it is possible to do an inexpensive one – well. This just isn’t it! And you know how we talk about NOT matching all your furniture pieces? For instance in a bedroom it’s nice to have the bed be different from the nightstands, but the bed, chest and dresser match. 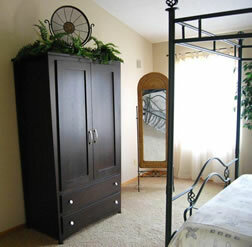 Or the bedroom suite is all the same but the armoire is a stand out piece. This kind of variety gives interest to a room. Well, in here, the armoire is contemporary, the bed is wrought iron, the night stand…well, is fabric, and the mirror is wicker…..TOTALLY Mismatched Furniture is decorating mistake number 13. This room has really taken the idea of “mixing it up” – too far! We can keep the ball rolling with decorating mistake number 14 which is about furniture placement. Sure, we found the mistake in a child’s room, but shouldn’t it follow some basic decorating rules too? Well, the furniture that you see is ALL the furniture in this room and it is all jammed on one side of the space. So, an Unbalanced Furniture Arrangement is decorating mistake number 14. To fix this, we could move the chest over to the wall to the right and I really think the bed should be just under this castle and painted floral arch…it just makes sense. The headboard will cover up some of the road leading up to the castle, but the fence that is attached to the walls ends on either side of the painted arbor and it just seems like the arbor was meant to go over the headboard. Then, with the headboard of the bed flat against the wall, the night stand will fit nicely right next to the bed where it should be. Now I know we have shown you beds on angles before, but in bedrooms it can be difficult to accomplish and still have the night stands functioning for you. By moving the furniture, the room felt better. The bed is still one of the first things you see when you enter the room and it’s in a very prominent position now with the castle coming right out of the headboard. And, the night stand makes more sense this way. With the tall chest on the opposite wall along with the little child’s chair you can feel the difference in the balance of this room. But, that doesn’t mean everything else is perfect. Let’s talk about lighting for a minute. I will give them kudos for having options to the overhead lighting. Overhead lighting is simply general lighting used for getting around the room safely at night and perhaps for vacuuming. It doesn’t create a nice ambiance in a room, rather a flat overall light. The lamps in the room have a couple issues. One is easy, the seam on the shade is showing and all you have to do to fix that is just turn the shade around. The seam is supposed to go to the back of the lamp where it can’t be seen. When the lamp is lit, it shows up even more. I”m not going to count this one, but it does make a room look uncared for. 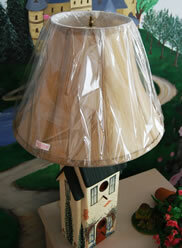 Then this lamp has the biggest problem of all and that makes it decorating mistake number 15. Never, never, never leave the Plastic Cover on a Lamp Shade. For one thing, it looks terrible, you might think it is keeping the shade clean, but it is actually creating a fire hazard. Think about how hot that light bulb is going to get and whether you would really want to put all that plastic that close to the light bulb. The answer is NO. Cut it off with scissors BEFORE you ever turn the light on. The last issue I found in this room is something that changes depending on what room you are in, what the function of the room is, and who uses the room. Its how high to hang a picture. This seems to be a universal decorating mistake. We see pictures hung way too high all the time and this one is no exception. 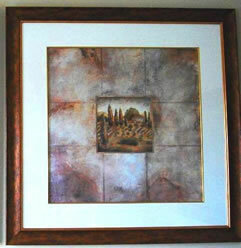 The basic rule of thumb for hanging a picture is to put the middle of the picture at eye level. In a dining room, your eye level would be while seated since you spend most of the time in that room seated. In a hallway, it would be higher because your eye level is higher in a hallway. 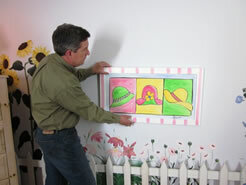 In a child’s room, eye level is low, so hang their artwork lower so they can enjoy it! Decorating mistake number 16 is Hanging Artwork too High. Now I should at least say something about how cute this room is decorated. 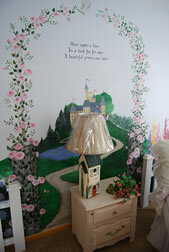 The hand painted mural really sets the theme of the room. This is something you can try yourself by copying a picture out of your child’s favorite story book, or hire an artist who will get it finished in no time! 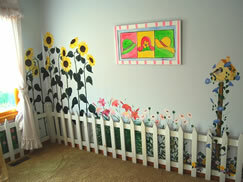 The picket fence is a fun addition, it is actual wood pickets and posts that have been painted white and attached to the wall sort of surrounding the garden that has been painted. Very nice, just needed a few tweaks! Like I said, no room is left out when it comes to decorating mistakes, and the bathroom comes next. So let’s see if you notice this one…..doesn’t it seem odd that you can see the shower head? Not very attractive is it? 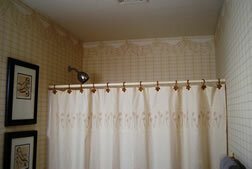 When you add a shower curtain rod, make sure you mount it high enough on the wall that the shower head is covered. Fortunately, what you see pictured is a tension shower rod, so it can easily be moved up to the right height and then tightened up again. But, there’s a problem. When you raise up the shower rod, the shower curtain comes with it and now there is a problem near the floor. The shower curtain is now too short. This can be a real problem because any shower curtain that you purchase is going to be this height. So, there are two options. Well, really three I guess. You can buy a shower curtain you like and add a co-coordinating fabric to the top or bottom to give it enough length to go just about to the bathroom floor. Or, you can sew your own shower curtain out of a fabric that you select, and make it the correct length. Or, you can forgo the shower curtain completely and just install sliding glass shower doors. But I’ll let you in on a little secret, if you do shower doors – I’ll be suggesting that you add a shower curtain anyway because the shower doors make the room too cold and echoey. So, Improperly Mounted Shower Curtains are decorating mistake number 17! Now I hope mistake number 18 doesn’t make too many of you mad at me. I know a lot of people use these, but they can be real germ catchers and are very hard to keep clean….they are toilet seat covers and their companion, the “U” shaped or contour rug. Listen, I understand if your toilet seat lid is a mess, but why not just replace it? These lid covers and rugs collect germs like you wouldn’t believe, and then they hide them so you don’t clean this area as often as you should. They are an all around bad idea, and they don’t look that great either! Ok, we’re getting close to the end, great job hanging in there! Number 19 is Ugly Exposed Electrical Cords. Don’t let yourself plug in a lamp, clock or appliance with a dark cord going across a white wall, or a white one against a dark wall. If the outlet is too far away, add an extension cord so the cords can lie on the floor near the baseboard and travel up the wall from just below the outlet. To make even those look more presentable, sew a cord cover which is simply a very long piece of fabric, folded in half and sewn into a tube. You don’t even have to put a hem in the ends, just tuck them in. Or, if you’d rather not sew your own, you can always buy one online. Just make sure the cord cover is two times the length of the cord so it is gathered and more attractive. If the plug on your lamp is too big for a cord cover, cut off the plug, slip on the cord cover and add a new plug to the cord. New plugs come in a little kit and are very easy to do. You’ll just need wire cutters, a wire stripper and the new plug. Decorating mistake number 20 is Too Many Family Photos jammed into one spot. Often times we see a shelf or table top covered in family photos. They are in mismatched frames and of varying sizes and the front ones block the back ones and it really isn’t the best way to display them. So how do we fix that? Well, most of the fixes call for getting them into some order. For instance, use all the same size photos with all the same frames and hang them in a grid collage on the wall in a hallway or above a table. There are a variety of nice frames that will hold several at once that make sense together, and I’m not talking about those old frames with the different size holes cut out of the matte. There are new versions of that idea that are much more sophisticated. If you prefer to keep them on a table, choose one or maybe three that you especially like and give them prominence. Maybe place one in the back on a plate stand or up on a couple of books to allow it to be seen. Then, rotate the photos out so the display changes every month or two. This makes it much more interesting for the family who sees the same photos day in and day out! So, that should be the end of the story, but you know me, I can come up with lots of “don’ts”, but fortunately, there are “dos” that go right along with them! Here are two more that we mentioned in the show to remind you. We had a pair of metal shoes sitting on our table with slots for hanging. They were sitting on a coffee table in the home we were visiting and it struck us funny that there were metal shoes sitting on a coffee table. This brought on decorating mistake number 21. Don’t be tricked into buying stuff just to fill in a space. Some accessories have no meaning to us or our families and they are just there taking up space. I would much rather see you have a bare table and wait for just the right item to fill it than have you buy four items you could care less about just to have the project finished. Decorating is supposed to take time. Your home is supposed to come together piece by piece, not all at once. Let a space grow and change with you and your interests. So, Buying Meaningless Accessories is decorating mistake number 21! And last, because my fingers are exhausted from typing….I know we mentioned the faux greenery before and this is somewhat along those lines; dried floral arrangements. Did you know that these do eventually die and need to be thrown away? “Die” meaning they get dusty and full of cob webs. I don’t know what it is about dried floral arrangements, but they attract dust like nobody’s business. I think as number 22 I’d almost say Forget Dried Arrangements completely! Well, there you have it. Sometimes it’s easier knowing what NOT to do than try to figure out WHAT to do. Just consider these tips. As you know, it’s your home and you should live in it the way that works best for you and your family. 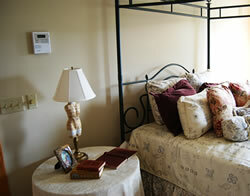 As long as it makes you feel welcome, relaxed and comforted, your home is perfect – for YOU! Are silk plants and flower arrangements OK to use? Truth be told, I couldn’t live without some silk greenery and flower arrangements. I can’t keep a single plant alive! I think the best policy is to simply keep them to a minimum. I’m sure you’ve seen upper kitchen cabinets filled to the brim with strands of ivy…this is just too much. Today the trend is to find other items of interest to display and fill open areas, or just leave some spaces bare to minimize clutter. I have an iron scroll sconce and from it hangs a beautiful cone shaped vase that requires beautiful fresh flowers to be in it. Well since I am very frugal and don’t want to buy fresh flowers weekly I do 3 things. In the spring and summer time I pick my fresh roses from my garden. The remainder of the year I place silk flowers in it. Only 3 bushy hydrangea type stems I change it out with Michaels coupled buys according to the season. Well here’s the funniest thing I do here. Since I HATE HATE HATE faux plants I actually add a little water to the vase so that it looks real!! Hahaha it does indeed look real too. That’s about as far as my faux flowers go though. No others are allowed in. If I have live plants they look pretty while they’re alive. Everyone knows they WILL die though because my thumb is black…not green. Let’s be real here, I raise kids and keep a husband alive so the plants are minor in comparison! Julie, you are hilarious and I’m going to try your water in the vase of silk flowers technique. I too have a black thumb, but my whole family is still living!!! I like all your ideas.. the hall way pictures I disagree. Everyone loves to look down memory lane! We’ve been married 33 years! Hi Carol! Thank you for commenting. I believe that if you do something in your home that makes you and your family happy and your guests enjoy looking at….it is always RIGHT! And, congratulations on 33 years! It’s your house! Use whatever pleases you…just not decorative toilet paper/lid covers! Ick. 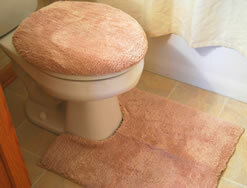 I’m keeping my contour rug and the toilet seat cover! I’ve never gotten sick from them and they do look nice. Having said that, I did like many of your rules! Thanks! Hahahaha, Linda! I knew I would get in trouble putting that into the article…my Mom feels the same way and we argue about it all the time! I’m happy to agree to disagree, and thank you for the kind spirited commment. I also loathe these rugs…but having a 4 year old boy who doesn’t always make the ‘target’ completely and wood floors, these have now become a necessity. Just a few more years, right?! Wood floors!! OY! Yes, a couple more years….at least!! I’m with you, Shari. I stopped using them years ago, but some people think they are hiding dirt and wee. But even if you can’t see the dirt, it’s still there! Is it too late to comment here? You have some great ideas! I live in a tiny apartment in NYC and my bathroom gets SO cold in the winter, especially the tile floor. I’m thinking about getting a toilet seat cover and the “toilet rug” hopeful it will help me “cope” with going into this bathroom to shower in the morning before starting my day. My theory is, the more cold tile and porcelain I can cover up with warm fuzzy cloth, the less cold I’ll feel! Purely psychological but I’m going to give it a shot! It’s hard enough getting out of bed on a cold winter morning. I’ll do anything I can to warm myself up! Brian, you are adorable. Yes, add as much fuzzy cloth to your bathroom as you can! I’ve been watching the weather up north, (I live in Florida but I’m from Ohio) and I’ve been through what you are going through and all I can say is BREAK THE RULES!!! Hope you stay warm this winter!! Nice to see some new comments. Enjoy the site and hearing from Matt and Shari et al. I don’t like these covers either, however, my daughter doesn’t seem to care that she is damaging the toilet seat lid in her bathroom by throwing it up against the handle. When she is out and on her own permanently (she’s still in college and comes home from time to time), I will gladly replace the toilet seat and remove the cover. Until then… damage control! Hey Shannon, you know, there are always those things that bring us all back to reality. Everything can’t and isn’t ever going to be perfect. Keep those covers until the toilet seat is safe! I agree with many things you say – but not artwork. Each piece of art should be selected on it’s own merit and artwork should not have to match a room or should not be selected by theme If you like landscapes – go for it. It should stand out on its own – like jewelry. The placement and grouping of it on the wall is important- I agree with that and it should be eye level. You don’t buy a painting for it’s color! Hi Carol – I love the point you are making and I do agree. Art is a very personal thing and you should purchase what you like regardless of the design of your room. I do think, however, that if you design your room to please your senses, it might follow that the art you select will please you in the same way and that both the room and art will feel like they belong. Thank you so much for taking the time to comment – I love reading everyone’s opinions and ideas! Can I hang pictures and collector plates together? I have two large leaf framed pictures and Lenox collectible bird plates. I would like to hang them on a stair wall. Hi Barb, sure you can hang them together as long as the prints aren’t too huge compared to the plates. Work out a pleasing arrangement on the floor first, then transfer that to the wall! I agree with most of your opinions. I was wondering if you would do as article about decorating a book shelf or shelves at the lower end of a counter. Your tips are very practical. Jeanne, I’ll add that to my list of articles to work on. I do have something on dressing up a china cabinet, but I’ll what I can work up on just bookshelves. Thanks for the idea. Your article on the china cabinets was very good. Alot of helpful ideas. Bookshelves leave me stumped. I am sure you will come up with something creative. Thank you. I tend to add narrow decorative items in front of books on the bookshelf. That way I can still have a lot of books on the shelf, but it doesn’t look like it’s all books. I have also hung framed pictures from the shelves so that they block parts of more than one shelf at a time. Can you hang a 37w x 46 picture over a couch? Rita, are you saying the picture is vertical? If so, it might require a couple other pictures or sconces or something on either side or in a collage of sorts to balance it over the width of the couch. If you are saying it is horizontal, it should be fine as long as the couch isn’t too long. Does that help? How about a window valence in the kithcen? Are they safe to use or too old looking? I don’t think a window valance can be old looking if you use a fabric and a style that fits your decor. It sounds like it would be a nice finishing detail to your room…go for it! Thanks so much for all these great tips.I have recently bought a new home and am looking for all the help I can get in the decor department.It is a little overwhelming at times but with great info like your post it seems to help a lot! oh-boy! the good news: I found your article so helpful! the bad news: I have a LOT of work to do now! LOL! If you like greenery in your home, place it where it fits best. It won’t compete with furnishings or artwork because it is a touch of nature. As for the corner at the end of the fireplace, if a chair would be put there that would add to a conversation area and fill in the space without being overpowering or too small and lost, then I like the chair idea. If it is too far away from the seating area, then a cabinet would make more sense. Keep in mind how the shape and scale of the piece you add in the corner relates to the size and shape of your fireplace. Don’t make them equal in size or shape – they need to be different to work well together. Hi Matt & Shari, I just want to say thanks for all your ideas. I have always loved your ideas and tv shows. It’s so nice to have some down to earth decorating for people who do not live in a mansion and cannot afford all the expensive ideas most designers give suggestions about. Keep up the good work. I love you guys. Jane, I TOTALLY second your comments. 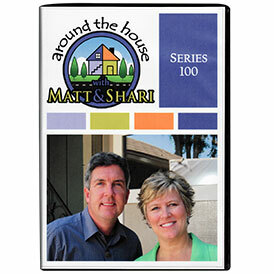 Matt and Shari – you are so special! Thank you for being you! I have an IKEA Hermes dresser, and i’m on the look out for nightstands. Should I just stick with the matching set or get something different? I’m not sure what will look good. When you are purchasing your night stands, it would be nice if they co-ordinated with something in the room. They could either blend with the bed and allow the dresser to be a standout piece, or you could match the dresser and the bed would be the standout. If you get too many different styled pieces in one room, it can end up looking like a second hand store – OR, it can be eclectic if done well, but it is tough to do. I stumbled upon your website by accident and was so excited to see it. I was a fan of your old show and did not know you and Matt had moved to PBS.I will be looking for the new show. Right now I am enjoying reading here. Thank you Martha for the nice comments. If you don’t find us in the PBS schedule now, check back in a month, they rotate us in and out of the schedule it seems. I have ivy mixed with string grape lighting above my kitchen cabinets. I receive so many compliments on the design. I have used this method for decorating my sisters kitchen and she gets plenty of compliments as well. Cord covers are the coolest. They add a touch of elegance and shows that one has attention to details. I don’t think I know what string grape lighting is. But in my book, if you are getting compliments and you like what you have done, who am I to tell you different? Thank you so much for letting me know what has been successful in your home! Hi, Shari. I am in the process of changing up our living room. We never really finished decorating the walls before and now I want to change it up some. I was wondering how much is too much when decorating a room? I have a few things with birds on them (bird on branches on the glass of a big collage picture frame, 2 carved wooden looking birds and a picture that has some kind of flower type design with a bird on it), but I saw other pictures and metal wall art that has a little bird mixed in with it also. How much is too much?! I don’t want to go overboard, but I love Kirkland’s and they have a lot of stuff I like! Lol! Amanda, you’ve mentioned all wall art, I think. How about adding your favorite bird motif in printed pillows, small figurines, maybe even in a printed drapery fabric? I have a question about your decorating mistake #13. I am currently trying to redecorate our Master Bedroom. 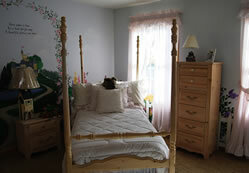 I have a matching set of traditional cherry wood furniture including the bed, dresser, armoire and 1 nightstand. So the furniture is very nice but obviously very matchy matchy and I would like to make the room more light and airy. My question is, can I add 2 nightstands of painted furniture to the room (minus the current nightstand)? How about the 2 nightstands plus a refurbished painted smallish dresser? Would this break the rule of too many mismatched furniture? or would there just be too much furniture in the room? How about if I just added the painted dresser and not 2 nightstands? I worry that it would not have anything else in the room to help it fit in. I obviously don’t know all the rules of decorating and would love your advice! Shawna, great question. When you have a set of furniture like a bedroom suite, I do think it is nice to break it up – just to add some spark and interest to the room if for nothing else. When you do break up a set, it’s usually best to break it up with one stand out piece, like an amazing bed or an unusual armoire. The smallish dresser doesn’t sound like it would make much of a statement in the room and I would not use it with the cherry dresser still in the room. the idea of the painted night stands could work to change things up if they still make sense in some way with what you have. For instance, if they are painted a distressed off white and have cherry tops and you have some off white in your draperies or bedspread. Even without the cherry top, a color could add some interest, but it will need to be repeated in the room for that to be the case. make sure they are the right scale for the bed too. Don’t bring in tiny painted nightstands that are very plain to go with an ornate cherry bedroom suite. gosh, I hope that helps a bit. It’s tough to give perfect advice without seeing everything you have! Hello !!! I was wondering if my hallway blinds has to match with my living room blinds ? In living room I have wood blinds , oak color. I AM not sure what to do . Hi Bianca, are your hallway windows in plain sight of the living room? Do they face out the same side of the house? If the answer is yes to both, you may want to use the same blinds so the windows appear to match on the outside of the house as well as inside. If your hallway is not seen from the living room or it is more a part of another space in the house, match the window coverings you have in that space! Found your article. It was awesome, and I have to admit you were absolutely right about the germ catching nature of the rugs in the bathroom! LOL! No, I have never gotten sick either, but when I flipped them over to do the routine cleaning, one word came to mind. Ewww. Looking at the underside of the rug almost made me sick. So, I changed it out with a teak shower mat. Not only is it comfortable, it is a lot more sanitary! And doesn’t require nearly as much cleaning. So thank you! Question about changing the toilet seat though now that the rugs are gone… is it tacky to have a different toilet seat color than the rest of the toilet, even if the toilet seat matches the rest of the decor? The toilet bowl is white, but I want to change the toilet seat to a dark, dark grey. It’s called Thunder Grey by Bemis. The base molding on my bathroom walls is dark, dark grey, and the door is dark, dark grey. Can I get away with it…fashionably? Takiyah, I think it might look interesting to have the accent color on the seat. Maybe you’ll start a whole new trend! If it’s hideous, can you politely tell me and NOT put it on your list of decorating mistakes! LOL! Okay, I’m going to try it and see if this is a trend-setter or a trend-forgetter. My daughter has a white metal headboard and we put an oak dresser in her room because we split up our old bedroom set between our two girls. Do you think the white headboard looks odd with the wood furniture? Should I have all matching white furniture in her room? I don’t know what to do. Everyone tells me that I should match the dresser. Please help. Hi Carmen, I think it depends on what else is in the room. Are there night stands and what do they look like? Is there a desk or chest or bookshelf? Generally it’s best if most of the furnishings match and then there is one piece that stands out – like the bed. The bed is a natural standout. So if everything else in the room matches, then the bed should be OK being different. Must a large piece of furniture always be centered on the wall. I would like to place an armoire slightly off-center to improve the traffic pattern. I would balance it with a chair/ottoman and a grouping of botanical pictures. Would this work? Hi Holly, you are absolutely doing the right thing. As long as there is something there to balance it’s weight you will be fine! While I agree with you, in theory, I have committed several of these sins! But I’ve never had a furry toilet lid cover….and I never will. Just..YUK! I need to take down my framed photos and get rid of my silk plants…but I just can’t stand those empty corners. Most of my transgressions occur in the areas people don’t see, though. I used to blame all the clutter on my younger son, till he grew up and moved away…now I blame my toy poodle! Diane, you are so funny, I’m going to use the son excuse too! You know, I have silk plants all over the place because they do hide cords and fill weird little areas. I think I was trying to get people just to think about it for a minute and maybe try something different. There has been enough said recently about greenery and what the options might be that I think I’ll write an article on that. Stay tuned!!! I do have a recommendation for your followers. I am not great with live plants and fake, even silk bug me. (I touch on Feng Shui just a little) I use plant stands in various sizes and use large beautiful botanical candles on them. Great for corners or most anywhere you would normally use a fake plant and considering what large silk plants can cost…candles and stands are a good value. Even when not lit, they give you a gift of a wonderful scent when you, family, or guest walk by, are beautiful and bring a touch of nature (using flowers and fruit) into your home! Hi!!!! Love this post and cannot wait to check out more! I do have a question though, as a single mom, I still own a tube television. Not because I want to, but because at this point I cannot afford to upgrade. Its a saving process. I have to work with what I have, but I am craftsy so I can do almost anything decorating wise that I want to. (Thank you pinterest) And I am desperately trying to make my house a home and decorating around that sucker has me going crazy! Any tips? Audrey, my Mom still has a big box TV and she has it in an tall cabinet with doors. when you open it you see the screen, not the depth of the TV…and we don’t even think about it!!! Let’s put this out there and see if anyone else has any ideas for you. I have a larger floral arrangement on my glass coffee table. I have a round table in the corner with a medium sized arrangement using only greens. Can I add one more floral arrangement if it is also medium in size? Is there a rule of thumb on the limit of arrangements in one room. I don’t want to overload. The colors are muted greens, ivory, browns and hints of black in the largest one. Thanks. Hi Kathy, I guess the more arrangements you add to a room, the more you dilute the effectiveness of the ones that are currently there. If you only have the one on the coffee table, then it stands out and makes a statement, a second will draw attention away, and a third will dilute it even further. If the arrangement on the coffee table is colorful and dominant and the others are small “greens” and appear as filler for empty corners or softeners for hard edges, that would be a different situation and you could add smaller “filler” greens here and there without much trouble. Hi Linda Heinz Dusky, same also here too. Linda, your lamps sound beautiful. If you walk into your living room and all you see is lamps, then yes, two of them might be too much for the space. Take one out and live with just the one for a bit and see if it becomes comfortable. sometimes as long as the lamp isn’t close to the entrance to the room it doesn’t seem as overwhelming. Use the silver him on your shade to find a silver metal floor lamp in a contemporary style that adds light but isn’t as intrusive to go along with the glass based lamp as an option. Don’t lose sleep over it, enjoy the process!! Great article! Ok so I have a question… this is actually what I ‘google searched’ and your article came up, though it did not cover my question, so I’ll just ask. Do you view wall art hung above a door frame as tacky? I’m younger, and a new homeowner… and I love me some cute, rustic signs! Sometimes I look at the ones I’ve hung above my bedroom door & bathroom door and think “that looks nice, fills in the space”… but I’m noticing that I now kinda view it as maybe just a littttle cluttered looking. And I definitely don’t want a tacky/cluttered looking home! Does anyone else hang things inbetween the ceiling & top of door? Would appreciate feedback, and I’m sure I’ll be back for more advice! I was just thinking it’d be awesome to be able to take pictures of rooms in a house and send them to Matt and Shari for tips on how to optimize a room, & make it look the best it could possibly look! Maybe one day, haha. I just feel so lost when it comes to decorating sometimes! Lisa, I personally like the idea of hanging something above a doorway between the door and ceiling. It’s a unique and interesting way to display something you love. I do think that it can be overdone, just like anything else. It sounds like you’ve only put it in two areas of your home – perfect, unique and interesting! Not sure why this comment of mine posted in 2 spots, but it is in response to #5. Hi! I’m so glad that I found your post! You’ve listed lots of helpful tips! I also have a question that I haven’t been able to find the answer to on the internet. 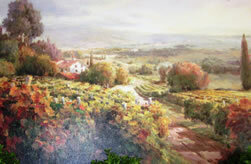 I have a 24″ x 36″ T. Kinkade painting of a beautiful mansion, and I’m having trouble finding the right place for it. I would normally hang it in my living/dining room, but I already have different themes going on in both. So the only space I really have available is a huge entryway wall to the left of the front door. That wall it also in desperate need of some color (which the painting would provide). But the thing I am concerned about is that since it’s a painting of a huge mansion, would it be odd to walk into a home and see a painting of another home?? I would greatly appreciate your opinion!! Also, it is odd to have multiple themes/art going on in one home–varying from indian, christian art, tuscan, and french cafe scenes?? (All in different rooms of course). Thanks! Hi Jasmine, I don’t think it’s odd to walk into a home and see a painting of another home. So, the entry might be the best place for that painting. 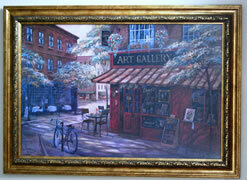 Art is a very personal thing, and it sounds like you enjoy quite a variety of styles and themes. I think if the style and colors of your furnishings throughout your home create a single cohesive statement, then the variety of art appears as a collection by someone with varied tastes. If every room in your home is in a different theme and colors, I think you would be wise to pare that down and tie a few rooms together – especially the public areas, or rooms that open up to each other. I have like a milk chocolate microfiber sofa and loveseat in my living room. I ‘ve never gotten around to buying a coffee table and end tables. I came across a set of wrought iron tables and the top is glass. What color of frames would go good with that? Currently I have like oak colored frames , should I go with black? Hi Alice, I think you are asking about wood framing around the glass of the coffee tables? I think the oak would be a nice contrast to the chocolate colored furniture and black wrought iron. You probably need something in there to lighten things up! Newly remarried I’m combining and redecorating and must use my hubs beer barrel bar (family heirloom) as the focal point in our great room (open floor plan) but I always leaned towards a transitional flavor of oaks and metals and some contemporary but we’re starting fresh. I’m willing to change anything to find an upscale casual, warm, elegant way to decorate around the barrel bar and avoid the man cave look. The barrel bar is beautifully repurposed (by my father) in med oak and originates from the bar my hubs deceased parents owned, so we both have a stake and treasure it. BUT, don’t have a clue where to begin. I know you could ROCK this so I hope you have time to consider ideas for us. Thanks in advance! Hi Konnie, how big is this barrel bar? Is it several barrels together to make it like five feet long? Give us all a few more details on how the beer barrel bar looks and we can all give you some pointers! The barrel is approx 3 1/2 ‘ tall and 2 1/2′ in diameter. It is a beautiful oak (now that it’s been refinished. It was the color of mold!) with four black metal bands going around the body (to hold the slats together) and has a bit of a gloss finish. The barrel is set on casters for ease of movement. The top is finished for a lamp or liquor decanter set. The door is 1′ x 1 1/2 hinged and opens to two lighted shelves. Right now I have liquor bottles on the bottom shelf and glassware on the top shelf. Any thoughts or ideas would be so much appreciated! Konnie, I see, it’s more of a cocktail cart. It sounds like it is attractive in it’s own right, so I think I would think about it as a unique antique. 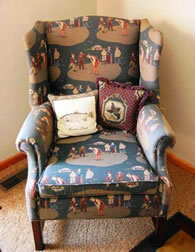 Many people have family heirlooms that they fit into their decor without having to “decorate to match” it. In fact, if your style is quite different, it might stand out nicely in a corner where you would put any other cocktail cart. Picture it in your mind as a “wrought iron and glass cocktail cart” for example. Where would you place that and how would you use it in the room? Then, because it is rather different looking, I think I might try to find some sort of accessories to gently support it. In other words, not so many things as to turn the room into a man cave, but just tasteful enough to show that you know there is a barrel in the room, and you embrace that. Wow, this is a tricky question to answer in mere words!!! I also believe that the charm of the cabinet would be lost if it tried to be other than what is. Elegance has to do with truth and simplicity. Placement in the room is perhaps the bigger challenge. I was thinking that since it is on wheels, it could continue the liquor cart idea by adding a black metal handle bar for “pushing”, silently proclaiming its purpose. Love to Shari and Matt. 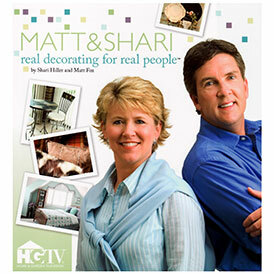 Hi Shari, I was going to ask when you and Matt were going to be back on TV, but then I saw where you said your are on PBS, Yea!…I’m so confused about what color to paint my hallway and bedroom? It’s not that I’m afraid of color, I don’t want to put the wrong color on the wall. I love all shades of gray with a hint of blue in them. The problem is we have nothing blue in the whole house. We are going to get a new sofa in the living room in a darker shade of gray, but what color should the chairs be? It’s open to the entry way and that’s the accent wall I’d like to paint Slate Blue. Can I paint a lighter shade of gray down the hallway? I really need your advice. Thank you. Hi Marcie, I think the combination of grays and blues will be just lovely. If you have nothing else in your home in those colors I’m assuming you are going to start a whole house makeover, starting with the new sofa, chairs and accent wall in the entry. The slate blue accent wall would be very nice with a lighter shade of gray for the hallway. If you continue to use slate blue and gray in your furnishings, you will need another color that will be a true accent, since the other two shades blend so well together. For instance, something in the warm tones like a gold, orange, or citron green? It might be best to find a patterned fabric for your chairs that brings in colors other than just the gray and slate blue. This is just a suggestion of course. If you want the slate blue to be the accent, you are planning on a very calm and simple color scheme. Choose an off white for your side chairs, or a lighter gray or black, a light blue would be lovely or a pattern using a variety of tints and shades of the gray and blue you have chosen. It’s probably safe to say I’d need more information about what your goals are for your home to really give you a specific answer, but hopefully some of these ideas get you thinking and help you to make some decisions! My solution for not letting a shower head show is to use a valance on a tension rod. I actually never use shower curtains. 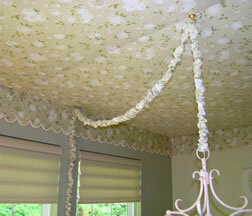 Instead, I use 3 tension rods – one for the liner, one for the curtain, and one for the valance. Instead of buying shower curtains that don’t come with a valance, I use regular curtains. I’ve also used two curtains and swagged them on either side of the enclosure. I think regular curtains look nicer than shower curtains. I really miss your tv shows and hope they become available in my area – Room by Room was my favorite! HI Joanne! Great tips, thank you for sharing them. I have a decorating dilema that is generally considered to be a “mistake,” My husband’s bath has a wallpaper border installed that he loves and refuses to part with. This bathroom is small and has 15′ ceiling because it is at our roofline. I want to refresh this room with new fixtures and new flooring. Afraid to paint the wrong color; blue could be too cutesy and anything dark could be cave-like. The beige color of the walls now makes the blue lighthouse-themed border look too much a contrast. What’s a girl to do? Can I use the same curtains for a kitchen window as I have in my living room? If so, café length or floor length? My living room area and kitchen are just one open medium sized room, so kitchen curtain would be completely visible from the living room. I’d greatly appreciate any advise. Thanks. Hi! Just wondering if the floor changes from the living room to the kitchen? And, where exactly is the window? I think cafe length would be better in a kitchen just from a practical stand point, and using a matching fabric and design make perfect sense as well. If the floor changes that makes doing a shorter version easier. If the floor is the same and the window is by an area that might be considered your dining room….then you can get away with using floor length drapery. Did that make sense? The flooring is the same throughout the whole area. The window in question is not in what I’d consider the dining area but directly in the kitchen. I have a buffet right under that window. Could I maybe get away with a curtain hung from the top edge of the window and ending at the windowsill? Oh and I had planned on using the same semi sheer panels as I have in the living room and adjust the length myself. Do you think it would look OK? Thanks. Loved your suggestions! I have a question: in our new Florida townhouse (with neutral walls throughout – Sherwin WiIlliams “Sand Dollar”), I was thinking of using the same color L.L. Bean coverlet (“soft teal”) for all three of the bedrooms: the Master Queen, the Guest Queen and the two Guest Twin Beds. I have plans to use wall hangings, rugs and pillows to add more color. Any thoughts on the use of the same color coverlets for all the beds? P.S. The floors are laminate – oaky color and the ceilings and trim/doors are white. HI Joan, I don’t see any reason not to do all the same color in the different bedrooms. Just to keep it lively and interesting for you, I’d use slightly different companion colors with the teal in each room in things like the area rugs and pillows. maybe add comforters or throws at the ends of the beds for those chilly nights or when the air conditioning is too high. In those you could give each room it’s own personality as well. Congratulations on your new home! Thanks, Shari! Great ideas that I will definitely try! I am currently painting all of the interior wall in my pretty large historical turn of the century home. we are painting the living room and library a greige color, the dining room a darker shade, the kitchen is an off white, and the breakfast room is a light blue color green color. The hallway is closed off and has stairs. Right now it is currently white. My question is can I leave the hallway white? It is such a big space and so I am trying to avoid paining it, but I’m wondering if it will look weird to have one large room in the house white while the others will have a warmer color? Hi Aerin, I know exactly what you mean about the big white space. Stairs are areas that aren’t easily painted and we tend to want to leave them as they are. I think that the white must bother you or you wouldn’t have mentioned it. when other spaces in your home are warm and probably blend with wood trim or doors, the white will stand out as if it is just a primer and not painted at all. Unless you have a way to make it seem like the white is intentional, like a collage of black and white family photos in frames, or very colorful artwork that would stand out nicely against a white background, almost like a gallery….I hate to say it but I think you’ll be happier if you paint it. We have recently downsized to a much smaller home. I like to think that I have a knack for decorating, but I have been at a total loss of what to keep & what to get rid of. It’s like I can’t even picture what will look good & I used to be able to envision something before I did it. We haven’t painted, so I am working with all beige walls at the moment. Should I wait until we paint to decorate? My hubby wants me to decide on what we keep now so we can clear out the clutter. Any suggestions??? I think you might be psyching yourself out. You know what you are doing, but when it comes to figuring out an entire house at once, it is a lot of pressure. You should start with the largest pieces of furniture and make those decisions. You might even draw up a floor plan of your new place and make paper cutouts of all the furniture. Move things around, fit them in place, and then you can eliminate those things that won’t fit. By doing this you are addressing function before form, or decor, and that’s the best way to go. Then, once you know what large pieces you are keeping, you will have a better idea what decorative pieces, artwork, and pillows you will want to keep…..THEN, you’ll know what colors to paint! Does that help at all? Yes, that does help! I think you are right. I have just been overwhelmed. We are ready to paint our bedroom & master bath. Keep in mind, small bedroom & very small bathroom. My bedding is “Croscill Plateau”. I couldn’t figure out how to attach a pic, but it has greens, orange, rust, & an eggplant color. I’m having a hard time picking a color. I am not afraid of color at all. Could you take a look & give me some ideas for both rooms? Thanks so much for your help!!! agree on toilet contour rug around toilet BUT disagree on toilet lid cover mine looks cold without. Had one WITHOUT for a year, HATED it. you can get beautiful ones that look nice that coordinate. Have VERY NICE DESIGNER DONE 6K sq ft brand new house, put them in all bathrooms. looks SO much better if you do nice one. BISCUIT toilet does not complement the travertine, marble or granite. lid cover HELPS and can be changed FREQUENTLY. Also have a few beautiful silk plants made by high end florists in DFW area. Have five real plants, a few silk that are not the department store or mass variety. Hi Kitty! Thank you for sharing your preferences. I can see what you mean about the plain lid looking cold, and you’re right, they can be changed. I also like the thought that you can cover up a color that doesn’t really work well with your decor, hadn’t thought about that one! As for silk plants, I still have some and do enjoy them. Thanks again for commenting. I love your article. I’m just getting to the trend of refurbishing furniture. I found these super cute two drawer night stands. They are short about 20″ tall. They look like a Victorian style (but not too over the top). I think that if I change the hardware and paint them I could put a slight modern twist to them. Since they’re so short I was thinking of using them as end tables in my living room. Is it ever ok to do this or would this be Design Mistake #23? Hi Terrina! It doesn’t sound like Design Mistake #23 to me, it sounds like a crafty way to add some personal style to your space! Hi, I have a large framed metal design that I want to hang on a large wall in a bathroom. The door stays open unless it is being used of course. If I center the piece using the length of the wall, the metal piece will be partially covered up by the door. I am thinking that I need to center the piece on the wall from the open door. Thanks for your feedback. Janet, that is an interesting question. When you center it on the door when it’s open, how does it look when you are in the bathroom? If it looks OK there, that’s the way to do it! It’s a win, win! What about plants on top of white kitchen cupboards, plants, nothing, or something else? Peggy, that’s a tough one to answer. I’m so tempted to go with plants because they add softness and fill up the space. What you might try doing is googling images of white kitchen cabinets and see what else is out there that is attractive to you. I’ve seen many cabinets that are simply bare on top. It might be something to research and then try at home. If you simply love the plants, do what makes you happy! Afterall, it’s YOUR home and you need it to make you feel good, not follow a trend! I am in the process of redecorating my bedroom and I would like to know if I can mount my tv on the wall next to my dresser? I notice that a lot of televisions are mounted above the dressers but mine has the mirror attached so I need another option, please help!! Hi Sherette, admittedly, Tv’s look nicer if they are mounted over a piece of furniture instead of hanging alone. I have done it the other way, but we cut into the wall and created a box for it and that actually looked quite nice. We had both the cable and the outlet put into the back of the niche. What do you think about that option? You better update this column! Some of the stuff you list here are the hot decorating trends for 2015. Better get on board. Are you saying that some of the things I’ve mentioned as “not to do” or “decorating mistakes” are now Hot Trends???? I’d like to know which of these mistakes you think are now trends. This article is very useful and I enjoyed reading it.There are so many on point lessons that we should all consider. I cannot help but mention however, your use of the word “passed” in two examples in the paragraph about rug placement. I hope you will forgive me for mentioning this minor, but, I think, useful advice when using the this admittedly troublesome word. The usage of passed is in error when you write:”… but when it extends way passed the furniture” . Passed is the past tense of the verb to pass. Consider this: “The car passed the slow truck on the highway.” Past when used to describe a location in space is not a verb, as in, “Please do not go past the do not enter sign.” A good test is to see if you mean to use it as a verb, for example: “he passed the test”. You would choose past if you wanted to say something like: “I went past your house by mistake.” I’m sorry this goes on forever, perhaps this is one of my pet peeves and I should write an article titled, “20 common grammar mistakes to avoid”. Your article is very useful and well written and that one glaring mistake was just worth mentioning, I thought. Keep up the great work! Susan, I am thrilled to get your explanation of “past” and “passed”! I never know which to use and your explanation is very helpful. I will change it now, but keep the grammatical fixes coming…I’d much prefer being correct! Go ahead and write the article and I’ll put it on the site!!! Is it OK to position a chair in front of a wall-mounted TV as long as the top of the chair is slightly lower(3″-4″) than the bottom of the TV screen? The reason for locating the Barcelona Chair in this area is to create a more friendly seating arrangement when the TV is, “off” thereby allowing more people to be closer to facing one another. Is it taboo to have the same color walls in the entire house? I’m a big fan of neutral / calming colors – and my boyfriend and I are re-doing his place – which is a somewhat small apartment. There are neutral beige carpeting and this orangey/clay/brown hardwood floors. My plan was for white molding and a pale gray wall – but that was also what we spoke about for the bedroom. Should we change the shade for the living room? Any advice on something not loud that will make it feel less orange? Or stick with the pale gray? (the plan is to alternate color schemes in rooms…like a yellow scheme for living room with some teal, ect ect. Hi Dominick, about 18 months ago I painted my whole house one color and I loved it. Now, 18 months later, I’m thinking there are some rooms I’d like to change just for a little variety, like bathrooms and bedrooms. I still enjoy the rest of the house being in one color to really tie it all together. Question on how to center a China cabinet. We have a dinning room wall that is 10′ in length. Facing the wall to the right is a 3′ door to the kitchen. I say the cabinet should be centered using the full wall of 10′ that way the chandler is also centered in the middle of the cabinet. My wife says the cabinet should be centered excluding the door opening, or if the wall was only 7′ in length. This makes the chandler more towards the right side of the cabinet looking straight on. Who is right ?? Hi David! Oh, this is a sticky one! If you put the china cabinet on the wall in the middle of the 10′, the chandelier looks right, but there is a large space on the left side of the china cabinet, right? Can you fill the space in with a chair? plant? rolling cart? Lining up with the chandelier is preferable but centering on the 7′ space may end up being your best bet. Remember, the chandelier only lines up perfectly with the cabinet when you are standing in only 1 position. I’m guilty as charged when it comes to using bathroom rugs and toliet lid covers. What I don’t understand is the “eww” or “fear of germs and dirt” factor. Our home has a powder room and two full bathrooms but I don’t have just one set of bathroom rugs/covers for each. In fact I have three sets for each room that I switch out for laundering about every 3-4 days, when I’m cleaning each room. I never find “dirty” surprises and wonder why other people would have only one set limiting their regular laundering and I question just how often and how thoroughly other people are cleaning their bathrooms. Anastasia, you are exactly right. You are the only person I’ve ever heard of who uses them in the correct fashion….for a few days at a time! Thank you for commenting!!! Or just break all the “rules” and actually be creative in a room YOU love and feel comfortable in. The designs I like today don’t follow the rules. They mix patterns, they mix metals, they mix styles, color, mix vintage and modern, etc…just have fun and CREATE! Louis, you are exactly right! If you have the creativity and are fearless, go for it! I love to hear from people who can break the rules and be really happy and comfortable in their spaces. I have a vacation home and I have a number of expertly put together dried flower arrangements, since it would be possible for me to keep teal plants or flowers alive between visits. You know, there are ALWAYS exceptions to rules and you have a perfect exception! Is it weird to have a self shelf longer than the table below it? Loved your article. But I have a question. It’s been 3 years since we moved into a new home after 30 years in our old home and new furniture is needed. After months, and months of looking for a sectional, I found one that I love. My question is – is it a decorating faux pas to have the same sectional in 2 different rooms (a den and living room) but with different decorative pillows? Celine, I’ve never come across that question before but I understand. If you find something you love, you stick with it – I do that with clothing for sure. so, can you see both sectionals from any place in the house? Is it obvious they are both the same? I like your idea of throw pillows, but can you have one covered in a different fabric? If they aren’t visible from each other, why not? I’ve been told that it makes furnishings look ‘finished’. I think it simply makes them look cluttered. I do disagree about faux greenery. Some of it is very nice looking, and although real may be preferable, some people don’t have the time, inclination, or green thumb to deal with it. My wife and I have a running debate on authenticity. We put together a bathroom with a roughly parisian 30′s feel – deep red walls, some dark metal. My wife wants to hang a picture of the Eiffel Tower or something that says Paris. My position is that people in Paris rarely need to hang a picture of the Eiffel Tower when they can look out the window. I feel that our guests may or may not get the exact theme of the room but hitting them over the head with it cheapens the rest of the look. Thoughts? Well, you did describe it as “roughly” parisian 30′s feel…..maybe the Eiffel Tower helps bring the theme to life for everyone to enjoy? Hi. I would like to ask a decorating question. We are in the middle of remodeling our kitchen. We have opened a wall between the kitchen and family room with a half wall. Is it OK to still decorate the family room with eagle pictures I have and love? There is almost no room to decorate the kitchen, but is it OK to use wine décor in there where I can or is this a no no with it adjoining the kitchen? That is a tough question to answer without more information, but if you have similar colors in both the kitchen and family room in your furnishings and your case pieces and cabinets, then eagle pictures (probably not much color in them) and a wine motif(the stronger of the two design statements) should be fine.